Christmas Gifts and Seasonal Blessings! We’re now well and truly into Advent, a wonderful season of anticipation. And of shopping, too! I love buying Christmas gifts, though it’s not always easy choosing just the right thing (hopefully!) for the people I love. Almost all my presents are now purchased, just wrapping and posting to do. Phew! Still all the Christmas cards to write and send. Donations to give. Decorating to do. Meals to plan and prepare for… I’m very grateful for internet shopping and home delivery! In all the busyness this month that can tangle us up in a worse mess than last year’s Christmas lights, it’s so important to slow down, breathe, and give ourselves the blessing of a quiet moment to be still with God. What an awesome gift He gave us – His Son. The greatest blessing of all eternity, as a gift for us to accept and unwrap day-by-day in our lives. I just sit here shaking my head thinking how huge that is. Though I’m far from immune to the busy, so I need to remind myself often to take those moments to be still and reconnect with Him! Here’s some of what I’ve been busy with. New covers for The Macleans, my Scottish series, in advance of the final book launching. I’m hoping to make that early February, God willing. What do you think of the covers? I hope you think they’re an improvement on the previous versions, while still staying true to the feeling of the originals and looking similar enough readers can recognize they’re the same book! I’m still working on the first draft of the final Macleans story. It’s a complicated one! Think “You’ve Got Mail” crossed with “As Good as It Gets”, and that’s the starting point. A hero who is physically and emotionally challenged. A feisty heroine ready to take on the world. Brodie is soooooooo not an easy character to write. Flynn is turning out very differently to how I first imagined her, too. Still, I love them both anyway! And unlike most of my books where I start off with some sort of outline, at least a roughed out road map of the turning points, this one is pantsing all the way. LOL, makes life interesting. Thankfully, the story is progressing. Slower than I’d like, but that’s nothing new! I’d like to give each of these books some free days during January in advance of The Real Thing‘s launch, so if you don’t have them yet and would like to be notified of the free days, you can either subscribe to my newsletter here, or for fewer emails, follow me on Amazon. 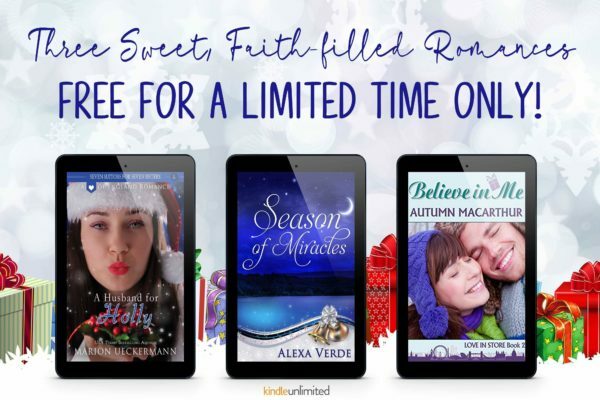 And talking of free ebooks, I’ve teamed up with my two closest author friends, also Inspy Romance authors, to each offer a free Christmas romance, the first book included in each of our Christmas boxed sets, as our gift to readers. Today, December 12th, is the final day these books will be free, so you’ll need to be quick! You can find the Amazon download links for the three free ebooks here, along with links to the Christmas boxed sets. The three solo ebook freebies should be free on Amazon worldwide. Every download, even of a free ebook, helps make our books and our messages of love, faith, and hope visible to more readers, so if you’d like to support us, please do download all three! Do you enjoy reading Christmas romances? I love writing them. LOL, though stories set any time of year are good. One comment made on this post before December 19th will be randomly chosen to win either an ebook copy of my Christmas set Together for Christmas, for winner’s choice of my current and future ebooks! Hi Autumn, so true. It is easy to get caught up in the busyness and miss the whole point of Christmas. That is why I love the Advent traditions- a great anchor point and refocus back to the gift of Christ. Glad you like the covers, Wendy. Yes, Advent has some wonderful traditions to ground us and remind us where our focus needs to be. I LOLed at the “curious fingers”. My darling husband is the worst for that. I need to hide his gifts till Christmas Eve, same reason! He pokes them and shakes them trying to figure what it is. LOL, I plan to do it differently this year – wrap them, then package them up in a big box! Good morning! I too need the reminder to be still…a lot! Your new covers look awesome! Thank you for sharing! Thanks Paula! Easier to say than do, the slowing down to be still part. But oh my, we need it soooooo much! I’m looking forward to Brodie’s story. He was such a sweet character in the other books. Thank you for making the new covers close to the old ones. I get really confused when I look for a book and can´t find it because the cover changed and i don´t recognize it. Romances are great to enjoy all year around, agreed! Brodie is certainly an interesting character, that’s for sure! And yes, I liked the old covers but felt they needed updating, yet with the same couple and colours. I get so atached to my characters, and once they get set in my mind, I can’t change how they look. I always have to choose the cover pic before writing, otherwise it’s impossible to find any stock photo that looks like my mental image of the characters! Hi Autumn! Thanks for sharing my favorite verse! Definitely has helped thru trying and busy times! Been reading Christmas stories since earlyOctober. In the 10 or so boxed sets, There are almost 100 stories. Unfortunately not enough time to read them all. Grandkids keep me jumping! Best wishes! Oh my, thats a LOT of Christmas reading! Yes, between all the sets, it can add up fast! Hi Autumn–love the new covers! Good luck with the final book. I know that can be a challenge, tying up all the loose ends. But I love those wounded heroes and I’m sure this will be a terrific finale! Thanks so much, Lee! I hope so! Thank you, Natalya, you too. Hope you have a lovely Christmas!